The Founders’ Second Amendment again soars to #1 category ranking at Amazon.com in Constitutional Law and Constitutional History (July 27). Stephen P. Halbrook testifies before the Senate Judiciary Committee against the confirmation of Judge Sonia Sotomayor to the Supreme Court (July 17). Dr. Halbrook testifies on C-SPAN against the confirmation of President-elect Barack Obama’s nomination of gun-control advocate Eric Holder for Attorney General of the U.S. (Senate Judiciary Committee, January 16). See his full written testimony here. Dr. Halbrook interviewed on “The Wake Up America Show” (Break the Matrix TV, December 24). Column, “Second Amendment Book Bomb is working. Join in?”, by Alan Bock (Orange County Register Blog, December 16). The Founders’ Second Amendment soars to #1 category ranking at Amazon.com in Law, Civil Rights and Liberties, Constitutions, Constitutional Law, Constitutional History, Freedom & Security, and Revolutionary and Founding History, as well as #12 in History, #11 in Professional and Technical, and #24 in Nonfiction (December 15). Article by Dr. Halbrook, “On Bill of Rights Day, Imagine the D.C. Gun Law in 1775″ (December 15). Article, “Happy Second Amendment Day, America” (Western Standard Blog, December 15). Review of The Founders’ Second Amendment, by Stephen P. Halbrook (Choice, November). Article, “Halbrook: ‘Second Amendment First’,” by Sarah Hinckley (Times Argus, September 21). 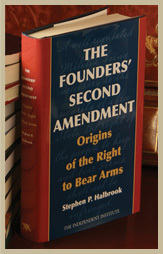 Review of The Founders’ Second Amendment, by Stephen P. Halbrook (National Review, August 18). Article by Dr. Halbrook and Senator Kay Bailey Hutchison, “Citizens’ Rights Reloaded” (Washington Times, June 29). Review of The Founders’ Second Amendment, by Stephen P. Halbrook (Publishers Weekly, April 21) (please scroll down). Presentation by Dr. Halbrook after the oral arguments in the landmark U.S. Supreme Court case, District of Columbia v. Heller (C-SPAN, March 18).